One of the reasons the electric industry has been slow to take advantage of common technology standards – which would speed Smart Grid adoption – is a lack of agreement on what those standards should be and who should issue them. Although smart grids are often likened to an internet for energy, there is one important difference. The internet is built on open technical standards, from internet protocol to move packets of data around to hypertext mark-up language to define the appearance of web pages. Agreement on standards has yet to be reached for smart grids, which can pose a problem when different networks and technologies are expected to work together. The banking industry provides a good example for the energy industry to follow. Open standards were developed so an ATM card could be used withdraw or deposit funds from almost anywhere in the world. ATM’s features a similar user interface, understandable whether or not you know the local language. Users don’t give it a second thought. It simply works. Yet the fact that the ATM exists at all was made possible only by industry-wide agreement on a multitude of common standards, from communication to security to business rules. Agreed-upon standards would allow companies to buy and sell devices, services and software in the knowledge that they would work together. ANSI – American National Standards Institute - (Wikipedia) - A private non-profit organization that oversees the development of voluntary consensus standards for products, services, processes, systems, and personnel in the United States. The organization also coordinates U.S. standards with international standards so that American products can be used worldwide. ASHRAE - American Society of Heating, Refrigerating and Air Conditioning Engineers - Pronounced 'ash'-'ray' - (Wikipedia) – Building Standards- An international technical society for all individuals and organizations interested in heating, ventilation, air-conditioning, and refrigeration (HVAC&R). ASHRAE publishes a well recognized series of standards and guidelines relating to HVAC systems and issues. These standards are often referenced in building codes and include Standard 135 – BACnet - a data communication protocol for Building Automation and Control Networks. AHAM - Association of Home Appliance Manufacturers – Appliances Standards - represents the manufacturers of household appliances sold in the United States. AHAM develops and maintains technical standards for various appliances to provide uniform, repeatable procedures for measuring specific product characteristics and performance features. AHAM is an ANSI accredited Standards Development Organization, and maintains several standards which are approved by ANSI. Blockchain - A technology that supports distributed trading—such as the cryptocurrency Bitcoin—which is threatening to disrupt a number of industries. Its name describes what blockchain software does: transactions are stored in virtual blocks, which are connected together in a chain, creating a complete history of all transactions that have ever occurred within a particular network. Potential use cases for blockchain are being developed in many different industries, particularly where it is desirable to accelerate transaction times, remove centralized market control, reduce the cost of performing transactions, and ensure trust between different market participants. While many use cases have been proposed for the energy industry, the one gaining the most traction at present is peer-to-peer (P2P) power trading, where owners of small-scale generation can sell excess generation direct to other consumers. Today, centralized control of distributed energy resources (DER) restricts to whom and when DER owners can sell their energy back to the grid. A blockchain-enabled P2P model allows much greater flexibility and could be a powerful enabler for truly customer-centric transactive energy. The earliest adopters of blockchain will likely not be utilities, but other stakeholders. Currently, those leading the research into blockchain are the owners of DER and startups seeking to sell directly to them. CIM - Common Information Model - Aims to allow application software to exchange information about the configuration and status of an electrical network. The CIM is currently maintained as a UML model. It defines a common vocabulary and basic ontology for aspects of the electric power industry. The central package within the CIM is the 'wires model', which describes the basic components used to transport electricity. The CIM can be used to derive 'design artifacts' (e.g. XML Schema, RDF Schema) as needed for the integration of related application software. The standard that defines the core packages of the CIM is IEC 61970-301, with a focus on the needs of electricity transmission, where related applications include energy management system, SCADA, planning and optimization. The IEC 61970-501 and 61970-452 standards define an XML format for network model exchanges using RDF. The IEC 61968 series of standards extend the CIM to meet the needs of electrical distribution, where related applications include distribution management system, outage management system, planning, metering, work management, geographic information system, asset management, customer information systems and enterprise resource planning. EPRI - The Electric Power Research Institute (Wikipedia)- Conducts research on issues of interest to the electric power industry in the USA. EPRI is an independent, nonprofit organization funded by the electric utility industry.. EPRI's area of interest covers most aspects of electric power generation, delivery and use. Following Senate hearings in the early 1970s on the lack of R&D supporting the power industry, all sectors of the U.S. electricity industry—public, private, and cooperative—voluntarily pooled their funds to begin one of the first and most successful industry-wide collaborative R&D programs in the world. GWAC - GridWise Architecture Council - Formed by the DOE to promote and enable interoperability among the many entities that interact with the nation's electric power system. GWAC is neither a design team, nor a standards making body. Their role is to help identify areas for standardization that allow significant levels of interoperation between system components. They are helping to outline a philosophy of inter-system operation that preserves the freedom to innovate, design, implement and maintain each organization's portion of the electrical system. In a partnership with NIST, the GWAC sponsors the Grid-Interop conference, which has the goals of achieving system-to-system interoperability, business process interoperation, preparing for a sustainable electricity system, developing policies for integrated smart energy and a holistic view of generation to consumption. IEC- International Electrotechnical Commission – Electrical Standards - (Wikipedia) A not-for-profit, non-governmental international standards organization that prepares and publishes International Standards for all electrical, electronic and related technologies – collectively known as "electrotechnology". IEC standards cover a vast range of technologies from power generation, transmission and distribution to home appliances and office equipment, semiconductors, fiber optics, batteries, solar energy, nanotechnology and marine energy as well as many others. The IEC also manages three global conformity assessment systems that certify whether equipment, system or components conform to its International Standards. IEEE – Institute of Electrical and Electronics Engineers (Pronounced eye-triple-e) (Wikipedia) - An international non-profit, professional organization for the advancement of technology related to electricity. It has the most members of any technical professional organization in the world, with more than 365,000 members in around 150 countries. IEEE standards affect a wide range of industries including: power and energy, biomedical and healthcare, IT, telecommunications, transportation, nanotechnology, information assurance, In 2005, IEEE had close to 900 active standards, with 500 standards under development. One of the more notable IEEE standards is the IEEE 802 LAN/MAN group of standards which includes the IEEE 802.3 Ethernet standard and the IEEE 802.11 Wireless Networking standard. 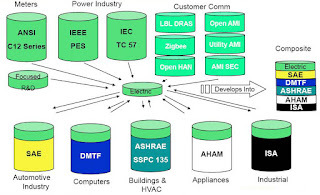 IntelliGrid Architecture - Led by EPRI it is a world-wide and industry-wide project to develop the infrastructures necessary to support the next generation of energy conversion, delivery and end-use systems. ISA - International Society of Automation - Industrial Standards - (Wikipedia) (nee Instrumentation, Systems, and Automation Society and Instrument Society of America.) - A non-profit technical society for engineers, technicians, businesspeople, educators and students, who work, study or are interested in industrial automation such as instrumentation. ISO – International Organization for Standardization - An international-standard-setting body composed of representatives from various national standards organizations. While ISO defines itself as a non-governmental organization, it has the ability to set standards that often become law, either through treaties or national standards. MultiSpeak – (Wikipedia) - Utility Information Exchange Standards - A specification / standard that defines standardized interfaces among software applications commonly used by electric utilities. It defines details of data that need to be exchanged between software applications in order to support different processes commonly applied at utilities.An industry-wide software standard created by (National Rural Electric Cooperative Association (NRECA) that facilitates interoperability of diverse business and automation applications used in electric utilities. NERC - North American Electric Reliability Corporation - (Wikipedia) - Utility Reliability Standards - NERC reliability standards define the reliability requirements for planning and operating the North American bulk power system. NERC has recently issued security standards for the bulk power system. Although these security standards are explicitly for the bulk power system, it is clear that many of the requirements also apply to distribution and AMI systems, and may eventually become standards for these systems as well. OASIS - Organization for the Advancement of Structured Information Standards - (Wikipedia) - Web Services Standards - A not-for-profit consortium that drives the development, convergence and adoption of open standards for the global information society. The consortium produces more Web services standards than any other organization along with standards for security, e-business, and standardization efforts in the public sector and for application-specific markets. OGC - Open Geospatial Consortium - (Wikipedia) - GIS Standards - A non-profit, international, voluntary consensus standards organization that is leading the development of standards for geospatial and location based services. One for the Smart Grid is Geography Markup Language (GML), an XML extension that can encode all types of geospatial data and can also be scaled down for lightweight applications such as the GML application schema in the Internet Engineering Task Force (IETF) Presence Information Data Format (PIDF-LO) standard for location payloads. PIDF-LO, designed for communicating privacy-sensitive presence information, is being incorporated into numerous other Internet standards, including SIP. GML is already in the International Electrotechnical Commission (IEC) Common Information Model (CIM) standard. SAE - Society of Automotive Engineers – (Wiki) Automotive Standards – A professional organization for mobility engineering professionals in the aerospace, automotive, and commercial vehicle industries. Developing standards for electric vehicles. UCAIug - Utility Communications Architecture International Users Group. Includes OpenSG subcommittee The Users Group is working on many areas of interest for different users wherestandards bodies may not yet be active or where the interests of users goes beyond thepurview of the presently identified standards (such as the completion of users guides,industry education, transfer of technology, marketing support, identification of users needs and industry demonstrations to prove concepts). HAN - Home Area Networks (My Blog Article) - Includes devices with a single premise (industrial site, commercial business or home) communicating over one or more networks. Electric utilities are looking to leverage these networks to provide relief during high demand periods (demand response) by communicating through some type of home gateway bridging utility and home networks. FAN - Field Area Networks (My Blog Article) - Includes devices communicating over one or more networks between the individual service connections and the utility back office applications. This network is primarily supported by an Advanced Metering Infrastructure deployment, as this is the most widespread communications network a utility can install. Included in a FAN are distribution automation and control (DAC) devices. SAN - Substation Area Networks - Includes devices communicating over one or more networks inside of a single electric substation. These typically are capacitor banks, relays and other substation automation equipment. This network is often the farthest zone of operation of a SCADA (supervisory control and data acquisition) system. One group is working to extend a SAN standard (IEC 61850) to include more than one substation (substation-to-substation communications). WAN - Wide Area Networks - The bridge between FANs and SANs and the utility LAN and back office. This includes communications from control centers to the substations. This is commonly referred to as ‘backhaul’ communications. LAN - Local Area Networks- Identifies a “close” set of devices in communication, as the name implies, in a local configuration. Often each floor of a building may be on its own LAN, or a single server room may be a LAN. HANs, FANs and SANs are types of local area networks. The traditional solution for interoperability problems is to let more time pass and let the standard mature. Implementers discover the weak spots in the standard and utility users eventually begin to demand more mandatory items. The industry eventually develops guidelines for implementation that restrict the number of ways a vendor can implement the standard to a minimum set. IEC 61850, for instance, is about to release a second edition closing many of the “holes” in the first specification, three years after the first edition. However, the regulatory and economic realities of Smart Grid deployment mean that some utilities do not have the time to wait for the standards to mature. Interoperability - Several applications require integration and harmonization across these operating environments. In addition convergence on common semantics for communications with Consumers including but not limited to pricing and control signals exchanged with consumer equipment would minimize the complexity of adding services to the Smart Grid. Coordination - Several organizations are working independently on consumer communications semantics for a variety of applications. These activities need to be brought together under specific focused work in concert with Standard Development Organization activities. 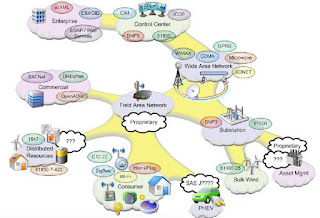 Common Semantic Model - A common semantic model for application level communications is necessary in several areas of the Smart Grid. Key areas, for example, are the integration of utility T&D Field operations with Information Technology and Back Office Systems. Common information model. For instance, a CIM message to generate an energy price event, transmitted in the enterprise domain, must be translated to an equivalent ANSI C12 message to travel across the WAN and Field LAN and then translated again to a corresponding ZigBee SE message before it reaches a thermostat in a consumer’s home. Such translation is necessary because there is typically no common network layer used across all domains, and generally not enough bandwidth to carry an enterprise message verbatim down to the thermostat even if there was. There is even less agreement on how such a message might be translated and sent to a pole-top distribution automation device using, for example, DNP3. At the moment, each of these translation steps is completely ad hoc and vendor-specific because there is no agreement on a common object model that works in all domains. The CIM, as a data model specific to the enterprise domain, is a good starting point; and various parts of UtilityAMI are beginning the first steps of harmonizing it with other technologies, but there is much work to be done. Too Many Options -The process in which specifications were developed means the standards contain options for most of the possible ways that vendors have implemented these utility applications over the years. The standards therefore contain many implementation choices with few mandatory items, and implementations are difficult for utilities to specify without significant internal expertise. Lack of Testing - Utilities use these standards in areas that have traditionally been dominated by single-vendor implementations, and for economic reasons unfortunately continue to be so despite the use of the standards. Therefore, the standards receive little significant multi-vendor interoperability testing in real-world situations. In some cases, such as ANSI C12, no organization exists even to provide certification testing. Although it is less effective than true interoperability testing, certification would at least represent a major step toward interoperability. Differing Business Context - Devices implementing the standard typically can establish basic communications and exchange simple information very easily. However, when trying to deploy more advanced functions, utilities discover that vendors follow differences in philosophy that cause them to not work well together. The GridWise Interoperability Framework identifies these philosophical differences as a lack of interoperability at the level of Semantic Understanding, Business Context, or Business Procedures. Lack of Common Meteorological Models -Weather has a major influence on electricity demand and, in the case of renewable energy resources such as wind and solar, may also influence supply. A common mechanism for communicating current and predicted weather would help in managing electricity supply and demand in real time as well as for planning purposes. Most forward forward-looking energy markets are based on assumptions about weather. Detailed knowledge of local weather and micro-climates is used by service providers and building operators to influence their operational decisions. IEC 61850 has a weather model included, but that standard is primarily used for substation communication and is not used across all Smart Grid domains. 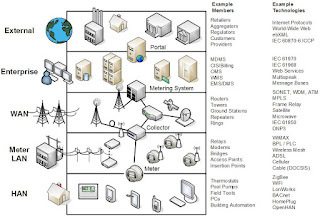 Lack of Common Geospatial Models - Many aspects of smart grid information exchanges require the specification of the physical location of assets, events, and other objects. This is best accomplished using well defined geospatial information models. One example is the work of the Open Geospatial Consortium, Inc (OGC) - an international industry consortium participating in a consensus process to develop publicly available interface standards. The OpenGIS Standards provide the tools and information models necessary empower technology developers to make complex spatial information and services accessible and useful with all kinds of applications. Lack of Common Scheduling Mechanism - The Smart Grid will be a dynamic marketplace with many participants. Synchronized activities are dependent upon shared schedules. Scheduling activities, prices, maintenance, etc. will help level the playing field across the participants and support a dynamic, competitive, and efficient environment. (See my blog article Standard Development Process) In 2007, Congress declared in the Energy Independence Act (EISA) that modernizing the grid is national policy. EISA required the National Institute of Standards and Technology (NIST) to develop a consensus on the standards and protocols necessary to ensure Smart Grid functionality and interoperability.